Forget ramen or even peach burger buns. 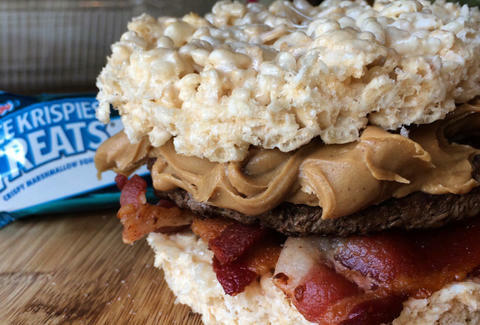 Because now, we have the Vulgar Chef's Rice Krispies Treat burger, which might be the last burger you'll ever eat. Because it could kill you. Naturally, the only vegetable involved is the grass the cow ate pre-grilling. It's topped with peanut butter and bacon, and it packs enough calories and sodium to put Snap, Crackle, and Pop into comas. And it is majestic. Kristin Hunt is a food/drink staff writer for Thrillist, and is certain her body would mount an all-out rebellion if she ate this. Follow her at @kristin_hunt.